Dozens of students flocked to the one-story ranch home in Columbia, S.C., to attend what was known as "The Michael Phelps Party" during the first week of November. Michael Phelps was the main attraction at the infamous party where he was photographed smoking from a bong. College students dubbed the weed-filled boozefest "The Michael Phelps Party" and the Olympic champ didn't disappoint, placing a $2,000 bet on a high-stakes beer pong game to the amazement of onlookers, a half dozen witnesses told a South Carolina newspaper. Dozens of students flocked to a one-story ranch home in Columbia, S.C. during the first week of November to catch a glimpse of the record-breaking swimmer and to have the chance to say they partied with the gold medal winner, reported South Carolina's largest newspaper, The State. Marijuana smoke clouded the room as two dozen people passed a bong amid a larger crowd of about 40 people gathered on a Monday night, a witness told the paper. Two security guards flanked the door of the home and asked that partiers not take pictures of the Olympic champ, a witness said. "They were pretty strict about it at the door," party-goer Michael Whitworth told the paper. "They were just asking people to be courteous." In an adjacent room, Phelps was playing beer pong and plunked down $2,000 cash for a bet -- and lost. "I saw Phelps pull out a roll, a bank-wrapped $2,000," Whitworth told the paper. "He said, 'I'll match the $2,000.' Good ol' Phelpsie lost it, too." Phelps, who was surrounded by a gaggle of girls at the party, refused one student a photograph, saying that he couldn't be photographed while drinking. He did agree, however, to talk on the phone to the student's mother, who was a big fan. A female University of South Carolina student told the paper that sometime around midnight she saw a woman take a camera phone picture of Phelps smoking a bong, it's unclear if that is the picture that surfaced in the British tabloid "News of the World" on Feb. 1. "She took her iPhone out of her pocket," and snapped a photo, the student said. "I thought that's (messed) up." Phelps began the night with a group of friends at the Village Idiot Pizza & Pub, where two employees tried to guard Phelps from zealous photo-taking fans as he stood between the bar and the kitchen, a witness told the paper. 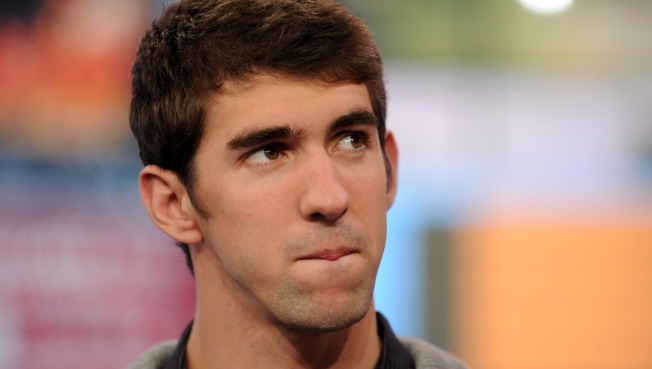 Earlier in the day, Phelps ate at Mellow Mushroom where employees kept a watchful eye one him, the paper reported.